It’s hard to believe that the school year is upon us. In fact, our district went back two weeks earlier than our neighboring counties, so the first week is already behind us, and it’s been an emotional roller coaster. I now officially have college, high school, middle school, and elementary aged children. Even though our first four children are only five and one half years apart, the grades fall perfectly like this for a year. Since three of our five are homeschooled, you’d think the typical back to school activities don’t pertain, but alas, they are drawn to fresh new school supplies and clothes just like those that hop on the bus each day. It’s the first year that I am having to make a school lunch every day, and considering it’s for our very large 17 year old son, it’s been quite a challenge, but I’m up for the task. He may be nearly a man, but every once in awhile I can love him likes he’s my little boy (because he always will be), and make him feel extra special by tucking something unique into his lunch. You may have a child that rolls their eyes at this idea, but trust me, years from now, they will remember it fondly. So whether they are pre-school or high school, give it a try. “Make them smile and let him/her know you’re thinking of them during those long days when they’ve gone back to school. 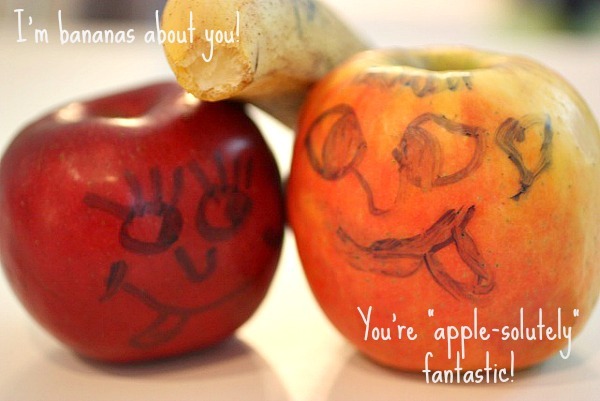 Place a smiling piece of fruit accompanied by a silly note in his lunch bag. Use a nontoxic dry-erase marker to make faces that are safe to eat or purchase a few Food Safe Markers for a few dollars . With a damp paper towel, it wipes right off. Read about some more Back to School Ideas and Traditions such as a Bus Stop Breakfast Bash or Carpool Wishes over here. Our tradition always includes a special dinner on the night of the first day of school. The girls request their favorite meal and we all eat dinner together and talk about how the first day of school went. 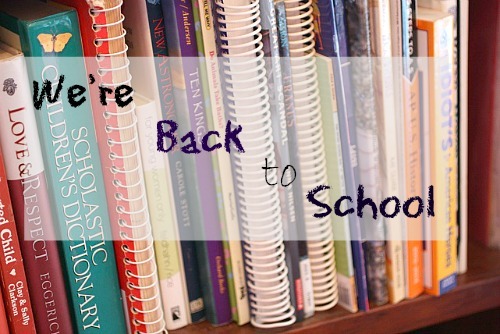 It helps us get back into our school year evening routine of dinner, homework, bath, & bedtime. I am a subscribe on Google Reader. Our back-to-school tradition… we don’t really have one because we sort of slowly start school in mid-July. We begin with the workbooks (math, grammar, and logic books), and then about a month later we start science. We do that for a couple of weeks before starting school full-force toward the end of August. I suppose that is a tradition, isn’t it? Everyone expects it, though not everyone loves it as much as our end-of-school tradition – a trip to Krispy Kreme donuts! We always made a big deal out of back to school shopping. It was fun that way. We also would have a special dinner on the first day of school. Our tradition is to take a photo the first day of school, and I like to pack a note in there lunches letting them know I am thinking of them and excited to hear about the first day. We are starting our third year of homeschooling. I had dropped the “first day” picture tradition, but we are going to do it again. Just don’t be surprised if they are in their PJs for the picture! I had neglected to follow you on Twitter, but I have corrected that and also followed Willa Skincare. We have pizza for dinner the first day back to school and talk about our first day. When I was a kid we always took a photo on the front steps in our very though out first day of school outfits. I plan to do the same with my boys. I follow you on FB….. faithfully! We homeschool, so the day that our books arrive is always cool and we have a big breakfast on the first day. We have a ‘back to school’ tradition of taking a picture of both of our children right outside our front door on the first day. It’s so much fun not only to see how much they’ve grown from the year before, but to also see what they’re wearing… most of it usually bargain/thrift pieces. As always, thanks for your wonderful inspiration! The night before all the kids are measured and marked on a long board to see how much they have grown in a year.they love it. I shared my comment about your contest on my FB page. I am a loyal follower! I am a current subscriber to your email news. Our tradition lately has been for my 2 girls & I to go have a pedicure together. It usually lasts about a month and is a fun girly reminder of our time together. I make a cake the night before school starts and my children get to eat it for breakfast. Yes, I know breakfast should be healthy, but I want starting school to be a celebration. I take a picture every morning, too. My oldest will be in her 12th back-to-school-cake picture when the time comes this year! We’re homeschoolers and typically go out to lunch on our first day of school, but this year we’ve decided to go out for breakfast. I will also take pictures. We start Monday. Our tradition is to take a picture of the first day of school for each of my kids. Another tradition is to go shopping for new school clothes with my kids. We used to go out for dinner at the beginning of a school year and my mom would ask us each what our dreams and goals were for the coming year. This is our first year sending a child to school. I have started the tradition of back-to-school date with just one child and myself, including a special dinner out and supply shopping. One-on-one bonding time for the hours that I will miss while they are away! I LOVE this idea to teach my daughter how to take care of her skin early on. She is already beginning to show some blackheads around her nose, yuck and I purchased a scrub. But I think these products look so much better because they are natural. Our back to school tradition will be starting with good habits in hygiene with my oldest 12 year old son as well as my pre teen daughter. Thank you for introducing me to this company! I liked Willa on FB. I am following Willa on Twitter. Having a special breakfast the morning of the 1st day of school. My daughter likes me to roll her hair in sponge rollers the night before the first day of school. We tend to ease into the new year. My kids love getting a new notebook or composition book for writing a journal entry every year. We are beginning this year so the traditional photo is a must! I like to put a joke in my son’s lunch each day. We always take a pic the first day as well. Our back to school tradition is to take lots of pictures in the same place in the house every year. I like Beauty and Bedlam on Facebook and shared the giveaway. I’m a subscriber and would LOVE to win some of the Willa products :)! I don’t have a tradition, but I love the idea of starting one! I always bake a special casserole. Its so yummy and my kids love it! I have “liked” on facebook. I am loving the Willa day face sunscreen. It would be fun to win this! I dont know that we really have a back to school tradition. Our special tradition is to take pictures the morning of the first day with a sign that says the age and grade of the child. Also i like to interview each child before they start the year! Our tradition is to shop for school supplies with them having their choice of backpack. i follow on twitter and tweeted about the giveaway! I’m a subscriber, this is my first year with no kids going to school! 🙁 but believe it or not for many years my tradition was to put the flag out. I read it in an erma bombeck book – and i thought it was great and did for several years the first week of school. Hi There! I have a 10th grade daughter, and I just began homeschooling her this year. We have a daily routine where we meet for breakfast, study Proverbs, go over her goals for the day, and pray. We are using the ACE curriculum which is self-paced, and I help her as needed. So far, so good! Also, I follow you on Pinterest, Facebook, and am a e-mail subscriber. We always have a special dinner the night before heading back to school.